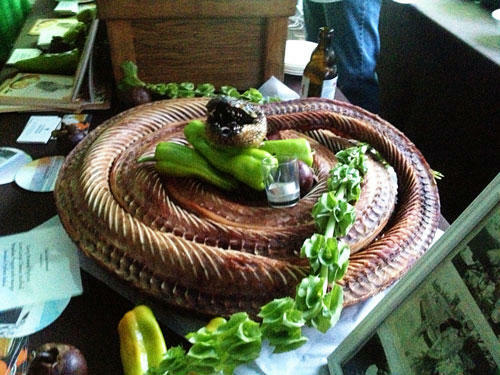 Chef Kris Wessel and his python display at an invasive species dining event. Editor's note: In the hunt for what to do about the various mix of invasive species found in Florida, we are running a series that not only describes the problems caused by these plants and animals but, well, offers a culinary solution. Tweet us (@WLRN) your ideas and tips or email us a recipe: WLRNMIA@gmail.com. Problem: Although non-venomous and unlikely to attack humans, Burmese pythons are a major disruption to the ecology of the Everglades. These invasive, non-native snakes grow up to 20 feet in length and can weigh up to 400 pounds. They consume all sorts of mammals, birds and even alligators, posing a risk to the wetlands food chain. Wildlife experts estimate that as many as 100,000 Burmese pythons are lurking in the Everglades. Solution: Florida recently hosted a Python Challenge, inviting hunters from all over the country to capture and kill the snakes for cash prizes. The competition netted only about 60 snakes, but officials said it helped raise awareness of Florida's python problem. 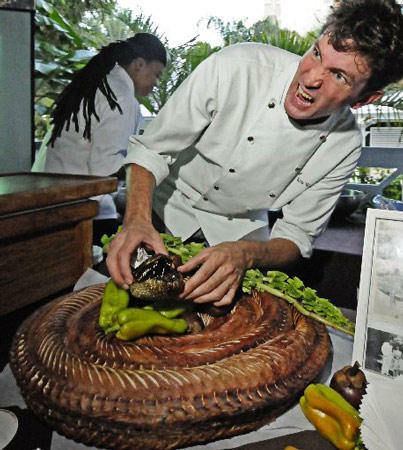 Miami chef Kris Wessel came up with a tastier solution at a charity dinner this month that featured invasive species. He smoked a 14-foot python over hickory wood for three hours, using its dried, chopped flesh as a stand-in for bacon bits in a mango-and-arugula salad. In a second preparation, Wessel braised the snake in curry spices and stuffed it inside also-invasive Brazilian peppers. Wessel advises cooking snakes like other reptiles: low and slow. "I cooked for 10 years in New Orleans. All reptiles, because they're so lean, you have to either grind up, braise slow or smoke slow." Another sure-fire way to cook, well almost anything, is to fry it. Chef Kris Wessel used this python to cook some smoked and braised python-and-Brazilian-pepper fritters. The snake is garnished with a snapdragon plant. Risks of eating python: Python can contain high levels of mercury. The python served at Fertile Earth Foundation's Underground event was tested by Darren Rumbold, a professor of marine science at Florida Gulf Coast University. Rumbold found that the python contained a level of mercury similar to what might be found in king mackerel, tilefish, swordfish or shark. Thus, the event organizers placed a disclaimer at the python table so that guests would be aware. Mercury ingestion at levels such these is more of an issue of chronic exposure, rather than an occasional meal. The Environmental Protection Agency and the Food & Drug Administration advise people to limit their consumption of high-mercury foods such as mackerel and swordfish. However, since python meat is not currently regulated, mercury levels can vary given different snakes. When it comes to pregnant women and very young children, it is best to avoid high-mercury foods altogether. Following guidelines from the EPA and FDA, Rumbold advises: "The simplest recommendation for women of childbearing age and children for any type of food with average concentrations as high as observed in this single python is 'do not eat.'" If you are concerned about mercury, you may want to also rethink your seafood intake. DISCLAIMER: Improperly prepared python meat can be dangerous. No means of preparation should be considered risk-free. 1. Beat the egg and milk together in a bowl. 2. In a separate bowl, combine the flour, salt, garlic, Tony Chachere's Creole Seasoning and cayenne pepper. 3. Dip the nuggets in the egg mixture, and then dredge in the flour mixture. 4. Deep fry at 375 degrees until crispy and golden brown. To accompany our Invasive Species Cookbook , we are also posting the potential health risks of eating certain invasive species and how to possibly mitigate those risks.